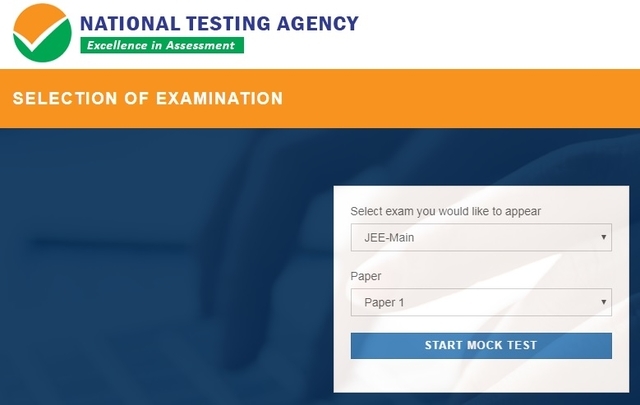 The National Testing Agency (NTA) has started online mock tests for JEE Main 2019 now. These online mock tests can be utilised by all those students who are going to appear for JEE Main 2019 exam in the month of January. Candidates who to get admission in B.E./B.Tech programmes at NITs, IIIITs and GFTIs (IITs) must practice these tests. After successfully qualifying JEE Main 2019, students can apply for JEE Advanced which is the gateway for admission into IITs. JEE Main mock test 2019 are facilitated by the National Testing Agency (NTA) for the engineering aspirants so that they can get the experience of the Computer Based Test (CBT) as this will help them know the paper pattern of JEE Main 2019 as well as to analyse their performance level for the engineering entrance exam 2019. This year onwards, JEE Main will be conducted in a computer-based mode entirely this is why students need to practice mock test as much as possible before the exam. How to attempt JEE Main 2019 Mock Test? 1. Visit the official website www.nta.ac.in. 2. Click on ‘Mock Test’ provided at the top of the homepage of NTA. 3. Enter your username and password in the space provided. 5. Read all instructions before taking the test and select language of test and read declaration and click on ‘I am ready to begin’. Note: The online mock test window also has a timer so that students taking the online mock test can have a real time exam experience as the actual exam of JEE Main 2019.